Expected Change – This is simply the rate of growth of the particular industry at the national level (equals the sum of the industrial mix and national growth effects). 1. San Jose-Sunnyvale-Santa Clara, Calif. (3.5%) – The heart of Silicon Valley has created 35,803 more jobs than expected since 2010, thanks largely to the information sector (most notably, internet publishing and broadcasting and web search portals and software publishers). Electronic computer manufacturing has also seen more-than-expected growth in the San Jose metro area, as has warehouse clubs and supercenters and private elementary/secondary schools. 2. Austin-Round Rock-San Marcos, Texas (3.4%) – Save for government and retail trade, every broad sector in the Austin metro area has exceeded expectations. The result is 30,472 more jobs than expected from 2010 and 2012. The strongest sub-sectors in Austin are wired telecommunications carriers; wholesale trade agents and brokers; and corporate, subsidiary, and regional managing offices. 3. Bakersfield, Calif. (3.1%) – Bakersfield has one of the highest unemployment rates (12%) among all metropolitan areas. But better-than-expected job growth in the construction and agricultural sectors has propelled this San Joaquin Valley metro to third in our ranking. The agriculture boom has been seen most in crop production and farm labor contractors/crew leaders. Meanwhile, much of the surprising construction growth has been in two sub-sectors — oil and gas pipeline and related structures construction and electrical contractors and other wiring installation contractors. 4. Provo-Orem, Utah (2.8%) – Next is Provo-Orem, which has the fourth-fewest total jobs of any top 100 metro (an estimated 211,639). This metro area just south of Salt Lake City has seen surprisingly large job gains in professional, scientific, and technical services (see here for more); administrative and support services; specialty trade contractors; state/local government; and computer and electronic product manufacturing. 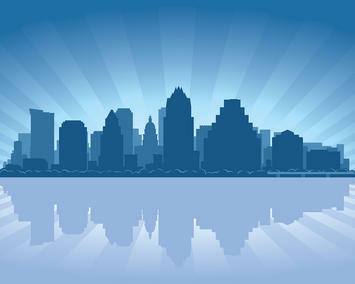 Austin skyline image by Bigstock.